ANISE ESSENTIAL OIL 1 OZ. 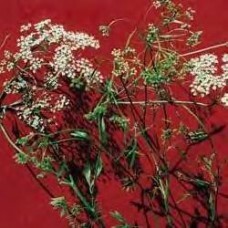 100% PURE Native to Greece and Italy, Anise is now cultivated world wide but the main producers are India and China. Steam distilled from the fruits of Pimpinella Anisum L. a volatile oil is produced providing the basis for its medicinal applications. Additionally Anise has been used in a variety of smoking mixtures. In Turkey a very popular alcoholic drink called raki is made with the sweet and spicy, and somewhat licorice scented herb which is a favorite among the people. Muscles: This oil can be used to relieve muscular aches and pains as well as to ease the effects of rheumatism. Respiratory: This oil is very commonly used to aid with bronchitis and coughs. Digestive: Those who have had problems with flatulence or indigestion have found this oil very useful. Immune System: Widely used to help with colds. How It's Made: The seeds are placed in oil and the essential oil is extracted through steam distillation. Safety: This oil should be avoided in all allergic and inflammatory skin conditions. In large doses the oil can slow down circulation and lead to cerebral disorders. Use this oil moderately and avoid it during pregnancy. Anise Oil should NEVER be used directly on the skin. The oil should first be blended with a carrier oil.